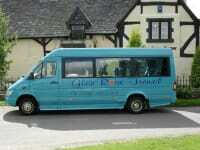 16 seater minibus hire. With boot space. We offer 16 seater mini busses. We've been established for 18 years. We're a family run friendly business. All drivers are polite and always smartly dressed. We have been providing first class minibus hire across Leicestershire and throughout the UK for 18 years. From booking to arriving at your destination, we guarantee to provide executive minibus hire of the very highest standard. Our reputation has gone from strength to strength because of the quality of our service. We understand that no event should be ruined by the journey, so arrive in comfort, arrive in style, and arrive in a Glenrose Luxury Travel minibus. For further information or to book a luxury minibus for your upcoming event, please don't hesitate to contact us. called at very short notice for a minibus for my daughters wedding day to transport guests, paula was so helpful and sorted me out in no time , even when I changed the time it was not a problem, wonderful, very efficient , friendly service , I would very highly recommend this company. Cant recommend this company enough! Took us all to the airport and when our flight was delayed they made sure everything was ready for us when we landed! I used Glenrose for a girly night out. Arrived on time. Very polite, smart and friendly driver. Would always recommend and definitely use them again.